1/ what is a hopper? 2/ THAT is not a hopper! To answer Number 1/ A hopper is a cup shaped rice flour pancake basically. 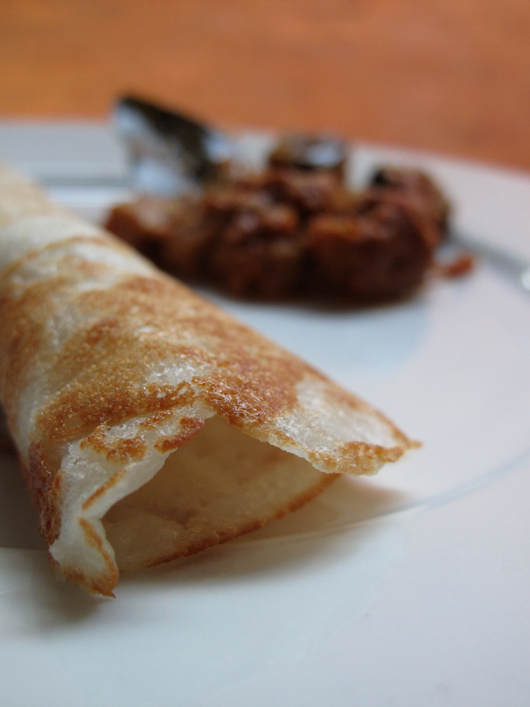 There a few different types, (string, egg, plain…) A staple from Sri Lanka quite often eaten for breakfast. Nothing tastier than dipping a freshly cooked hopper into some curry with attitude. This recipe is my take on the delicious hopper. So maybe not traditionally correct, but they still work. I even got my mum’s vote of approval. Add all ingredients together, and let sit for approximately 5 hours. Mixture is a like a pancake consistency, and should be bubbling away happily, when the time is up and they are ready to cook. Pop some of the mixture into the pan, if you are doing it in a rounded pan, let the edges get a little crispy and then popping a lid over the top to enable the steam to cook the inside. (The middle part will be thicker.) For egg hoppers, drop an egg into the middle, just before the lid goes on to steam. Serve with a great curry, ripping off bits of the hopper and dunking it in. Or, easy thing to have on Frugal Friday. Make the batch up in the morning, forget about it, then they will ready to cook up by dinner. Serve with some lightly cooked vegetables in some vegetable oil, garam masala, salt and pepper…and maybe a dollop of natural yoghurt on the side. 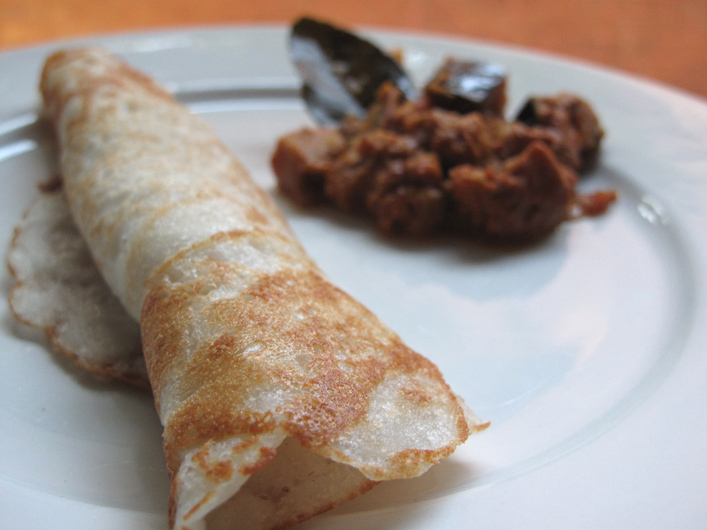 This entry was posted in Food Glorious Food, Making, Creating + Frugal Living and tagged curry, egg hoppers, food, Frugal Living, hoppers, recipes, rice flour pancakes, simple cooking, sri lankan cooking by cityhippyfarmgirl. Bookmark the permalink. Haven’t been to Janani, will have to look out for it though. Used to go to a place in Newtown, but they upped the prices too much. It doesn’t get much better than a little mopping up of a great curry Anna! Would that be the same as a dosa (not sure of spelling)? I have had them in India and Hong Kong – delicious. They look the same. Thanks for the recipe. I would love to try this. Debra they are similar, sort of. Especially the way i’ve presented them. Dosa’s use urad dal and rice that gets soaked overnight though, I think the hoppers are a bit more straight forward and using rice flour instead. Eaten the same way as a dosa though. I’ve never heard of these, but they look great, thanks! I am very impressed that you made hoppers…and using sourdough too! I’ve never heard of these – I’m going to make them- and by the way- YUM!!! Hope you like them Heidi! I was in the no 1 category, but now that I’m enlightened, I will be making hoppers – they sound really good. Have just made my annual batch of chilli sauce, so curry seems like a particularly good idea. Let me know what you think of them if you make them…and if you can get hold a hopper pan even better! Ok..didn’t know what a hopper was. but now I do and thanks for the recipe…they look great!…and so does your new theme…love it! Thanks Yvette, header needed a change. Hoppers are a great little accompaniment to a meal. Joanna I haven’t made dosas before, they always seem a bit too complicated so hoppers would be a much easier substitute. An evening of ripping and dunking is quite appealing isn’t it! 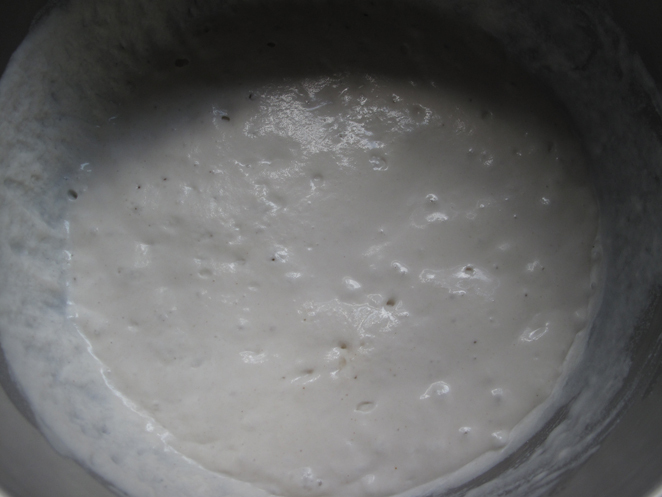 Brilliant especially using sourdough starter instead of yeast. Even us native hopper eaters from Sri Lanka have become lazy and use a packaged hopper mix! My 80 year old Mum still does it the traditional way making her own mix. 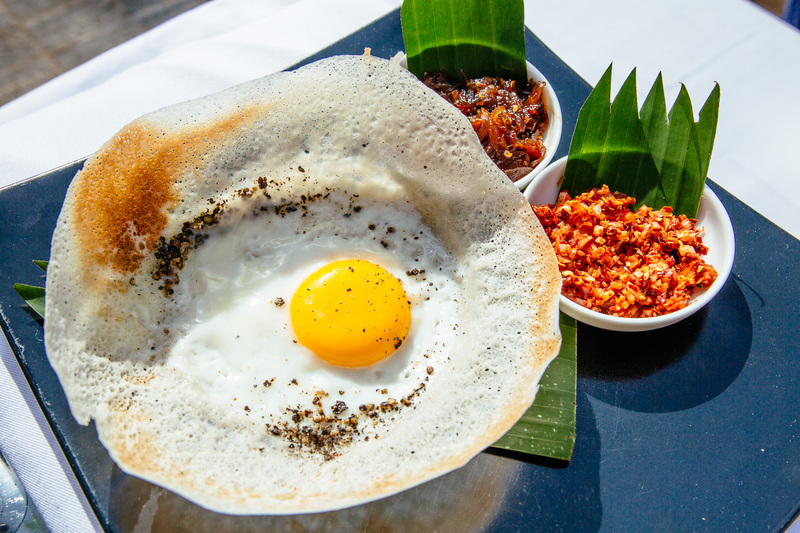 Curry Leaf at Seven HIlls have a good offering of traditional hoppers and egg hoppers (just break an egg into the hopper while it’s cooking) with curries and a variety of sambols. You can probably find a pan in a Sri Lankan grocery store. Well done and thanks for the inspiration. I wonder if your mum would approve of my hoppers? I am definitely on the look out for a hopper pan, will see what I can find. Thanks for your comment on my blog! I’m just a beginner at crochet, too–I learned this year. Fumbling my way through, but enjoying it. Crochet, I have a long way too go! Wow – how come I’ve never heard of these? They sound wonderful – and I just got a Wondermill, so I can grind my own rice flour – do you think they’d be better with brown rice flour? Many thanks, I’ll be making these on first opportunity. I’m not sure that many people would have unless you are around Sri Lankan cuisine. A close kept secret, lucky people! I think it was on Zeb Bakes I read that you were grinding your own flours, I’m impressed. That would be wonderful to be able to do that. Regarding the brown rice flour…I don’t know. It should be fine, just giving a slightly nuttier flavour….actually just pondering here, I’m sure it would be delicious. Let me know if you do make them. Kind of like a dosa? Very similar Jemas, but a bit easy to make. I’m new to your blog but my brother in law also makes hoppers using yeast. He lives interstate but I think he managed to get his hopper pans from a store in Brisbane, good luck with your ongoing search for them!